Earthrise Spirulina Review – How good are their spirulina tablets? Not all spirulina tablets are created equal and some are not that great. But Earthrise’s are great. In this Earthrise Spirulina review I will go over some of the reasons why I think their spirulina tablets are a great quality product Earthrise puts a lot of effort into making their spirulina the best, from a quality growing environment to many quality ensurance inspections. Oh, and the price is great. Like I said, Earthrise really puts a lot of effort into giving its spirulina the best and healthiest environment to grow in WITHOUT any pesticides, herbicides, or other chemicals. They pump in water (filtered) from the Colorado River, which is already rich in nutrient, and then they add more nutrients to the water. They add clean and pure nutrient sources including minerals like nitrogen, potassium, iron, and essential trace elements. They also bubble CO2 into the waters that the spirulina grows. This can be very important and necessary for healthy growth. Spirulina uses CO2 from the air, kind of like how us humans use oxygen. By supplying the spirulina with extra it helps it grow faster and healthier. To ensure the freshest spirulina, Earthrise harvests the spirulina out of its ponds and dehydrates it into powder in only 15 minutes. Throughout this whole process no human hands touch the spirulina. The process that they use to dehydrate the spirulina is a “quick dry” process and this helps preserve nutrients that could be lost if it were to dry over a long period of time. Also, the tablets themselves are good quality. As long as you swallow them without chewing, you shouldn’t taste any spirulina. Sounds pretty good, but is the source reliable? The source in which spirulina comes from is always important due to spirulina’s ability to absorb harmful toxins from its environment. Earthrise spirulina’s source is very reliable. It is grown, packaged, and sold from California and has been for over 35 years. Because it is in the USA, it is subject to inspections by government agencies to ensure safety, the FDA being the major one. They are also certified by few different organizations for their safe practices.These include GMP certified, Bureau Veritas certified, and GRAS affirmed. To be subject to all of these 3rd parties’ inspections and to pass them is a big plus. Earthrise spirulina is without a doubt a safe bet to eat. 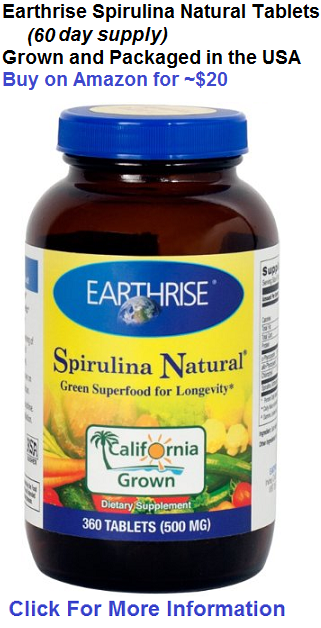 How is the price of Earthrise Spirulina Tablets? The cheapest place to purchase Earthrise Spirulina Tablets is on Amazon.com and it will cost you ~$20 for 360 tablets. The serving size here is 3 (500mg) tablets and it is recommended that you take two servings per day. So that means that this bottle will last you 60 days. Thats only about 33 cents per day, which is a good deal compared to a lot of other spirulina products. And you are getting 3g of spirulina each day if you follow their recommendation. That is a good dose for tablets and you should actually be able to notice the benefits of spirulina, not like some of the products that recommend 1-2 grams per day. Don’t bother with that low of a dose, its not enough to really do much of anything. I would say that Earthrise Spirulina Tablets are an all around great product for a great price. I do recommend this brand and this product. If you have tried this product leaver your own review below in the comment section!